A DISTINCTLY unique invention called the “Musicite,” an instrument which enables you to see sound waves of a note while you are listening to the same tone being played on the piano, has recently been perfected by Philip Grodon, world famous concert pianist. 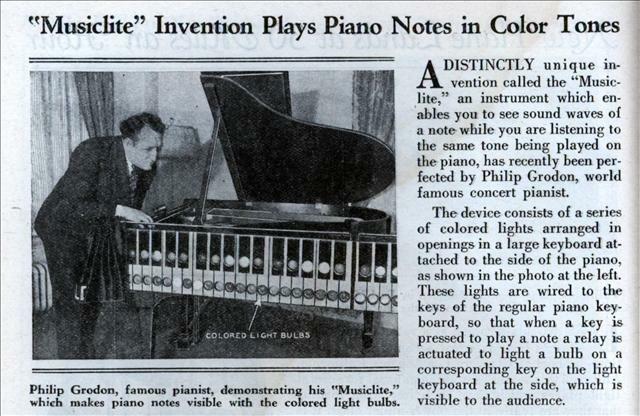 The device consists of a series of colored lights arranged in openings in a large keyboard attached to the side of the piano, as shown in the photo at the left. These lights are wired to the keys of the regular piano keyboard, so that when a key is pressed to play a note a relay is actuated to light a bulb on a corresponding key on the light keyboard at the side, which is visible to the audience.